Sadly 2007 saw the sad passing of this amazing dog.Just to prove there was still life in the old dog, Chip stepped back into the ring for one last time and won Top Veteran in Western Australia. He won this prestigous award just 6 short weeks before he was finally taken from us with terminal cancer. Some of Chips outstanding achievments in the show ring are; Champion at 8 1/2 mths winning 3 Best in Groups & a Runner Up Best in Show along the way. Shown 16 times as a puppy for 15 Puppy in Show Awards. Multiple Best in Show & Runner up Best in Shows at both All Breeds & Gundog Shows. Winning in excess of 20 Best in Groups. 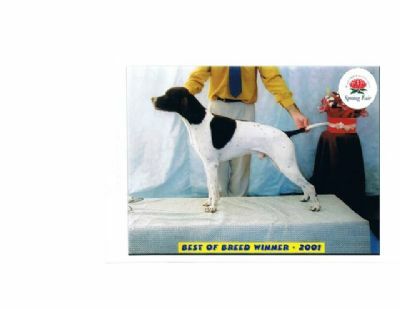 Best of Breeds at Sydney,Canberra,Brisbane & Perth Royals. Now retired in WA. 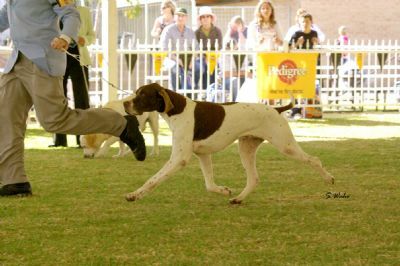 Chip stepped back into the show ring for 2005 Perth Royal as a 10 year old veteran and took Res CC, RUBOB and Veteran Gundog. As a stud dog Chip is an outstanding success. From his 7 litters he has sired,1 Australian Grand Champion,13 Australian Champions & 2 Singapore Champions to date with more on the way. 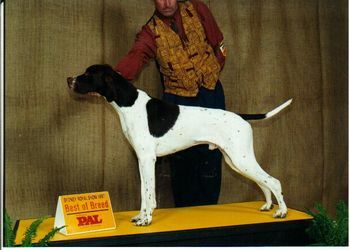 His grand progeny and great grand progeny are continuing in the show ring where this great dog left off.